When breastfeeding, women are supposed to drink plenty of fluids (to thirst should cover it, but that can be a lot of fluids! ), and honestly, water can be just a bit boring. 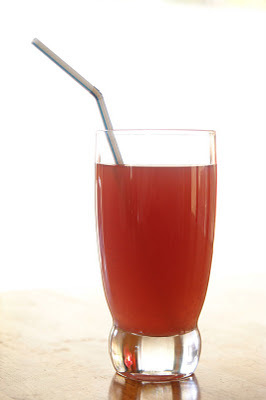 To help alleviate some of the tedium of water, my grandmother presented my mother with a homemade juice mix to give her some nutrition, extra calories, and variety in beverages to drink while breastfeeding. to avoid high fructose corn syrup and artificial colors, my mother helped me adapt the recipe. I'll be mixing up a few batches of this in the coming weeks, and put it in my freezer until it's time to take a little break from water! Mix all ingredients together in a large stock pot (an 8 qt pot just barely was enough - I suggest a larger pot). Store in refrigerator for up to 2 weeks, or pour into freezer safe containers, and freeze. I've never tried it, but you could probably make a nice slushy out of this if you froze some in ice cube trays for the purpose of blending. Please note that as a juice mix, this is not low calorie or low sugar. Be reasonable about how much of this you consume in a day, especially if you don't want to pack on extra pounds while breastfeeding! For more information about fluids intake and caloric needs during breastfeeding, please refer to kellymom.com. Kellymom is an excellent resource on all aspects of breastfeeding, and I highly recommend it!